Ojo's World: Blogtober17: All about me! I have decided to 'try' and get back into the habit of writing, finding time for me and expressing my feelings. It was when I saw Hexmumblogs Blogtober idea, I knew this was the perfect time. Basically she gives a title, each day of October, and you blog about it, your way. Today's is my favourite thing to talk about: ME! This blog is the only place where I am totally me, no fluff, no mam or wife, just my feelings and emotions. The picture above is me, no make up, no filter (except what my phone does automatically). I'm not your standard blogger. I don't have a niche. I don't make money from my blog (nor do I want to). I don't schedule posts, I write then publish. To non bloggers, this probably doesn't make sense! Basically, I write because I want to, no other reason. I love to sing and actually sang in a studio this year! As a gift, last Christmas, my hubby bought me a gift voucher, for a local studio. I cannot explain to you how happy it made me! I still am not sure how I feel about my singing voice, which is why VERY few people have heard my CD. However, it was fun for me and it made me happy to do it, that's all that counts. 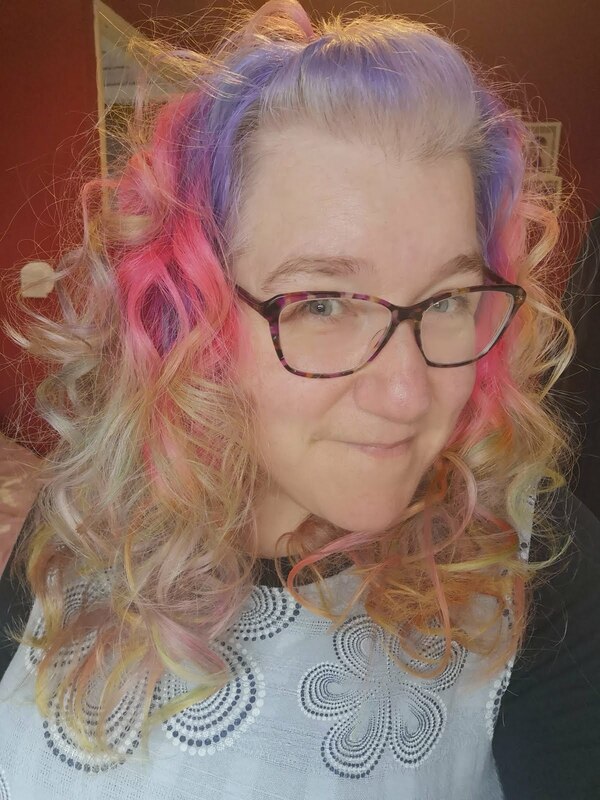 I love my rainbow hair, and it's permanent. These will not wash out, so each time my roots grow through, my hairdresser adds a different colour. I'm having orange next, and having my other colours brightened. I genuinely couldn't imagine being any other way. Also, no my hair will not fall out, it's looked after well and is in fantastic condition! I am the parent to 3 boys. I don't talk much about the eldest 2 anymore, as they are teens and I feel it's an invasion of their privacy. If I mention them, it's with their permission. So with permission I will mention that life isn't always easy. My eldest, nearly 20, suffers from anxiety, I have often had to calm him down from an anxiety attack, over the phone. He is doing incredibly well, in life, at the moment (if only his anxiety would let him sleep!). My middle boy, 14, has high functioning autism, something we didn't realise until he was a little older. He is a talented guitarist and incredibly bright, but when the mood flips he his quite a handful! My youngest, 9, is autistic, with related learning difficulties. He would completely change your perception of autism. He is a happy soul, with a love of books that is unbelievable. I often blame myself. I really do wonder if the problems with my boys are my fault? Did I do something wrong, in pregnancy? For all 3 of them to have difficulties, I have to wonder. Let's lighten this back up!? I love horror films. I compare it to people loving roller coasters it's a thrill, the fear and excitement. I recently went to see IT! and did not find it remotely scary, I actually laughed out loud more than I jumped! I asked my family what they would say, if they had to tell people about me. Hubby: That you'll do anything, for anybody, and not expect anything back. Lovely reading all about you. I love the comments from your family at your end. 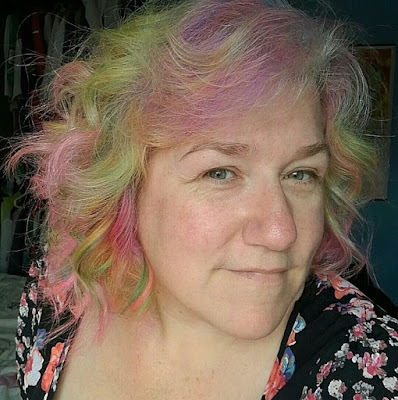 I have to also mention the rainbow hair, how fab is that. It totally suits you and i think your defiantly right to carry on with it. Ahh! I feel like I know you already but it's good to know more. I don't earn from my blog either. I am happy just to review the few things we do. Your hair is amazing! I love it.